Writing brings great joy to Jen’s life and she counts her published works amongst her greatest achievements. Her story telling has been described as warm, wonderful and most of all real. Contact us to purchase copies of her books. 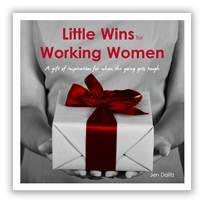 Little Wins for Working Women is the perfect gift of inspiration for any busy woman – if you know someone who’s ever felt like they’re juggling so many things they can’t keep up, then this hardcover gift book will be perfect for them. Features motivational quotes, beautiful photographic images and practical tips that remind women to celebrate all the successes in life. 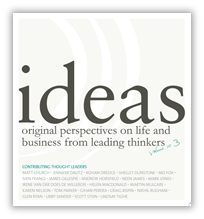 Featuring original perspectives on life and business from leading thinkers, Ideas Volume 3 is a compilation of ideas on everything from personal transformation to human performance, brand relationships, authentic communication, change management, innovative marketing and organic creativity. Jen’s chapter features a methodology for implementing change and innovation easily and effectively in work and in life – by getting real to get results. 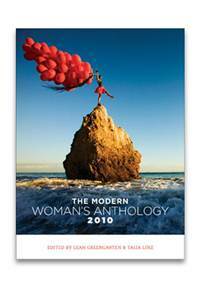 Bringing together twenty remarkable women, The Modern Woman’s Anthologyreveals a range of insights through personal stories based around what it means to be a woman in today’s world. Jen has authored the opening chapter of the book, chronicling her experiences of growing up in the country, of women finding their voice and pulling together during tough times to overcome adversity. Other contributing authors include Catherine Freeman, Dr Cindy Pan, Gene Sherman, Libby Hathorn and more… with all proceeds going to The Black Dog Institute.